We are currently looking to have two separate classes to compete in. One class will be the standard &#34;In the Box&#34; where the modded case is create from a standard manufactured case and the second class will be &#34;Scratch Built&#34; where anything goes. Do you have a id/Bethsda game themed case mod? If so BRING IT! You could win some prizes! With your support Modders-Inc.com will do everything that I can to make this a success. Here is a brief list of items that should have for the contest. Ã¢â‚¬Â¦ and with fingers crossed a few more to go. I smell a Road trip! We, as a group, need to make a presence at this event to show that Modders are the coolest people in the computer scene! A great turn out can make an impact and a hard statement about what we do and how much we are dedicated to our hobby. If we have to do our own separate case modding contest (Maybe a mini ModCon or something) at the event without the help of QuakeCon, I am willing to do this! 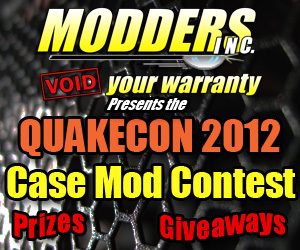 Send of emails to QuakeCon asking that a real modding contest be held and that Modders-Inc is the group to do it! With your support I will do everything that I can to make this a success. Email me if you can help make this happen. Just to let everyone know I have contacted a large number of vendors and offers for support have been coming in. Please spread the word so that we can show the vendors what they will get in return for their efforts! Put Mnpctech down for some giveaway goodies, to help you guys out! Any chance you might be able to make the trip? I am looking to see if we can find a place nearby the Hilton Anatole - where QC is being held- to try and do a case modders get together. Any native Texans know of a place? Also to let you know I have once again been in contact with PCPER.com that does a great &#34;Workshop&#34; at the event and has had a hand in the case mod contest. Anyone out there want to make up a banner for the event? I have too many obligations here, but helping spread the word about your event to other modders! Anything i can do to help out please let me know . Near the Anatole....there are a few things... but what are you thinking? Do you want a separate room where we all go to? or regular restaurant? We also need to get it onto the Quakecon Forum Whores forum. I need to intorduce you to Clayton Murley. We'll get that set up and publicized. Banner? Like a physical banner? How big?